Published on June 20, 2018 in New Hampshire Resort. Closed Tags: brewfest, craft beer, New Hampshire Resort. It’s no secret that the craft beer scene has taken off in the Granite State over the past several years. Here at Steele Hill Resort we fully support the local craft brewers by carrying their brews in our onsite convenience store, The Market, our onsite dining venue, The Hilltop Restaurant, and with an annual Brew with a View beer festival in the summer. 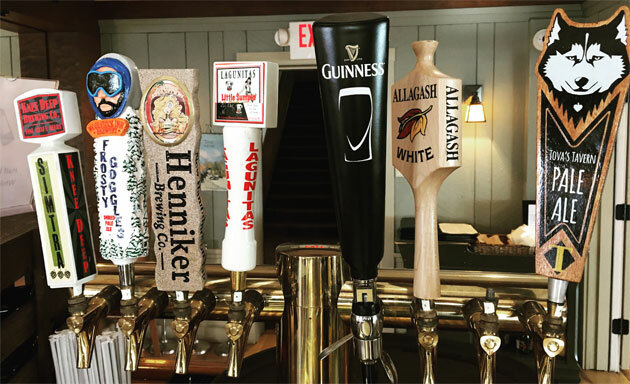 On tap at The Hilltop Restaurant and Tova’s Tavern we keep it all local with seven local drafts and two rotating throughout the year. We are currently offering Long Trail VT IPA made out of Bridgewater Corners, VT, Henniker Brewing Kolsch out of Henniker, NH, NBPT Maritime Lager from Newburyport, MA, Tova’s Tavern Pale Ale created by Tuckerman located in Conway, NH, Peak Organic – The Juice from Portland. ME, Smuttynose Robust Porter from Hampton, NH, and Woodstock Brewery’s Pig’s Ear Brown Ale from Woodstock, NH. For those who stay loyal and true to Bud Light, don’t worry as we always have that on tap as well. Our annual Brew with a View Event is coming up on July 7th, where over 40 local breweries will be sampling their beers. The event is held rain or shine from 4pm-7pm in the Large Venue tent at Steele Hill Resorts. VIP admission features an exclusive hour of limited tastings and swag from the brewery representatives as well as complimentary snacks and free event apparel to bring home as a souvenir. For more information and to purchase tickets for VIP Admission or General Admission visit abrewwithaview.com or give us a call at 603-524-0500. If you are looking to getaway this summer and are interested in our event we are also offering a Brew with a View Getaway package that includes 10% off accommodations of your choice as well as 2 VIP tickets to the event. It’s the perfect package to enjoy a romantic getaway and everything Steele Hill has to offer. Resort amenities include two outdoor pools, a four-season outdoor hot tub, golf course and more. Leftover beers from the event will come right back to us at the resort where our beer selection will nearly triple for guests to choose from over the Summer. For an ongoing list of brewers coming to the event check out our Facebook page to stay updated. 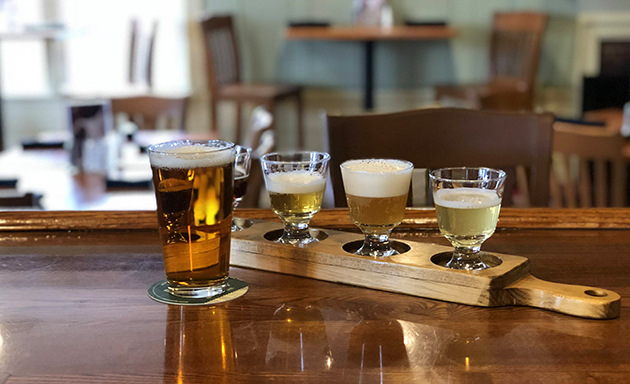 In the meantime, guests and locals are welcome to head up to The Hilltop Restaurant or Tova’s Tavern and enjoy a flight of 4 – 4oz brews for just $10. Published on March 22, 2017 in Lakes Region, New Hampshire Resort and NH Restaurant. Closed Tags: Brew with a View, brewfest, New Hampshire Resort, NH Resort. Beer enthusiasts are beginning to notice the not so hidden gem down at Tova’s Tavern. With the addition of our new tap system and an emphasis on quality microbrews, the beer selection is quickly becoming a major attraction in the restaurant. Our staff has doubled down on finding the perfect mix to tickle your fancy and provide a unique tasting experience. Guests are invited to sample the different brews to help determine the perfect choice for their particular tastes. Tova’s Tavern has been serving thirsty guests for decades and with the beer revolution sweeping the country some upgrades to the selection were an obvious fit. Beyond the enhanced offering at the bar, the resort has also embraced the new beer culture by hosting the annual A Brew with a View brewfest. The festival brings together a variety of regional microbrews from around New England as well as like-minded fans of craft beer. The brewfest offers a unique opportunity to research new ideas for the bar and get feedback from guests attending the event. It is really a win-win for our “research” team. With all the attention given to our beer selection, it’s no wonder Tova’s has been getting some extra attention these days. Just remember, if you plan a visit, don’t forget to pet the stuffed husky on the last bar stool. The tradition is guaranteed to bring good luck for years to come. Published on June 26, 2015 in Lakes Region and New Hampshire Resort. Closed Tags: Brew with a View, brewfest, New Hampshire Resort, NH Resort. June 20th, 2015 marked a special event at Steele Hill Resorts. As the sun came up over the Belknap Mountain Range and cast its rays along the length of Lake Winnisquam below, activity began to pick up near the festival tent at Steele Hill Resorts. Vans and trucks displaying all the colors and logos of New England’s microbrew industry poured into the south parking lot. The first annual Brew with a View beer festival was off and running. With vendors representing over 30 breweries and live music and food offerings provided by the resort’s Hilltop Restaurant, the event was the perfect destination for a beautiful, sunny Saturday. Over 300 attendees showed up to take in the festivities and sample the amazing variety of beers including small batch specialty selections. From the picnic tables overlooking the view to the beer tent hosting the brewers, laughs buzzed under the echoes of live music playing to the crowd. The enjoyment level was palpable. With the conclusion of the brewfest, it was obvious that Steele Hill’s unmatched vantage point overlooking the Lakes Region provided a special experience to all of the beer enthusiast in attendance. The resort’s unique setting truly complimented the festivities. With the resounding positive feedback and desire to introduce new visitors to Steele Hill, the planning is already on for 2016. Be sure to check back as we pick our dates and spread the word. Next year’s event is sure to be even more popular than the first.